Is there anything better than a cheesy pasta? I don’t think so! 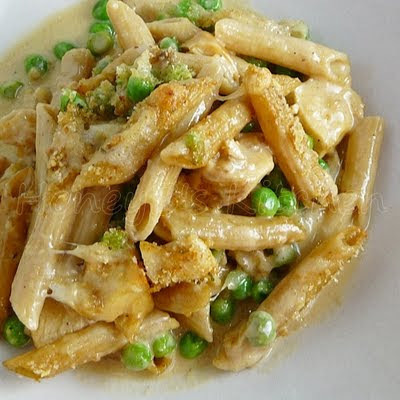 I love this Cheesy Penne Chicken Pasta dish. It is quick and easy to put together full of creamy cheese flavor with that toothsome pasta bite! Sometimes, when a person is sick, all they want is some comfort. In our busy, busy world, comfort can be hard to find when you want it. I’ve been sick most of the week. I’m not sure if it is allergy or cold that got me down but it got me down. I suffered through the afternoon on Wednesday at work and this morning when I was up at 3:30 and on the couch yet again I knew that I would go into work, do what had to be done, then go home. That I did, and I ended up getting a good 4 more hours of much needed sleep. I woke up around 4 in the afternoon and decided that I needed some food. Some comfort food. I actually felt good enough to dirty the dishes and eat the food, but when it come to clean up it was a little harder. I garnered help from Grumpy, to do the clean up, and will be headed right straight back to bed soon! The recipe I made for dinner was one that I came across while browsing one of the foodie sites one day. The pasta looked so appetizing I had to visit the blog it came from. Immediately I knew I found someone who knew just how I felt. The title of her post was “Comforting“. I had never seen Tasty Trials before, but you can bet I will be going back to read more of her blog. I had to do a slight spin on her recipe because of course, I was home and sick and was not about to go to the store. Instead of sausage I used chicken I had thawed out. Instead of feta I went with a mild cheddar. I also used frozen mushroom and peas. It was exactly what I needed. Some good, old fashioned comfort. Cook pasta according to package until al dente. Set aside. While pasta is cooking, cook chicken tenderloins, let cool slightly and then chop into pieces. Set aside. Cook shallot in olive oil until soft. Add garlic and saute a few minutes more. Add vegetable broth, bring to boil. Reduce heat to simmer and let broth reduce for about 5 minutes. Add heavy cream, bring back to simmer and reduce for 5 minutes more. Add cheese and stir until well blended. 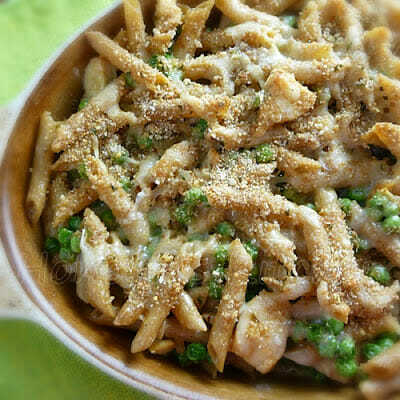 Mix pasta, peas, chicken, and sauce and place in a baking dish. Top with breadcrumbs and butter. Bake for 25-30 minutes. Sit back and enjoy your comfort. CHEESY PENNE CHICKEN PASTA – PIN IT! This looks amazing. I can't wait to make it for my baby boy! Sorry you were unwell Shelby. This does sound like a true comfort dish. Nothing like a creamy pasta to boost the spirits! I love comfort food anytime…sick, not sick, happy, sad..anytime. This looks fantastic. I can't believe you are that sick and still cooking. Not me!! If I'm that sick, we have cereal!! I sure hope you are feeling better. I hope you are feeling better now. You certainly prepared a nice pasta dish and I am not surprised it was comforting. Reading your post make me think about the last time I was really sick: I also managed to get up and prepare what I needed at that time to comfort me. Thank you so much for contributing this to Presto Pasta Nights. Linda, it was what I bought when I wanted to make that peanut butter caramel sauce….and fortunately it hadn't expired or gone bad on me yet! Something similar, only with smoked Gruyere, used to be on the menu at a local restaurant. I was sad when they took it off and added so many Tex Mex recipes. Sounds so good!I always stay away from cream based sauces because of them adding more calories.. but this just looks like it would be worth it! Those photos definitely say "comfort food" to me! I always crave some cheesey pasta goodness when I'm feeling the way you have been this week. Definitely a fabulous dish! Wow does this ever look great! It definitely does sound like perfect comfort food. I do hope it did the trick and cured you. Thanks for sharing with Presto Pasta Nights. Pasta is my #1 comfort food when I'm feeling sick. It doesn't do harm to my tummy, it takes 10 minutes, and it is delicious. Thanks for much for the kind words! It's always so nice to hear when someone makes a dish, and I'm so glad you liked it (the chicken sounds like a great alternative!). I hope you're feeling better and can enjoy the weekend!